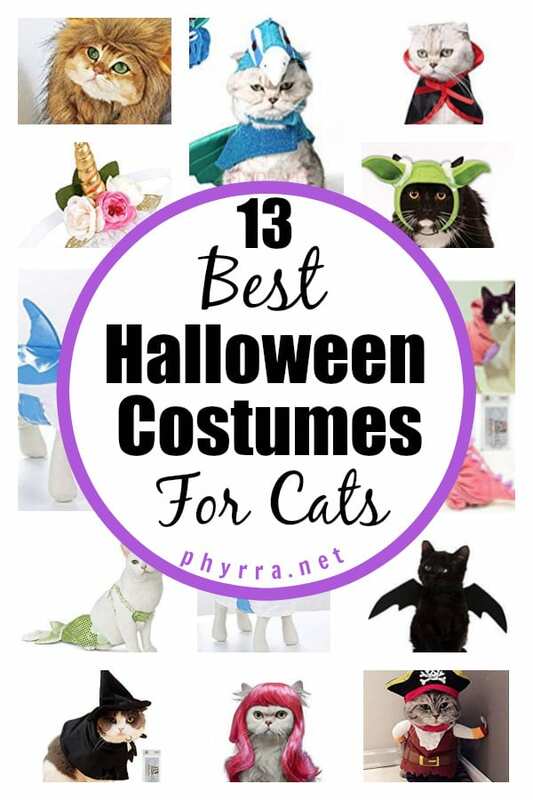 Today I’ve got the 13 best Halloween costumes for cats to share with you. You know I’m Halloween obsessed, so I had to do it! You can find all of these costumes on Amazon. Let your cat delight in the glitz and glitter of a sparkling mermaid tail. Kitty of the sea, indeed. Bring out your cat’s witchy side with this classic black pointy hat and cloak witch’s costume. This adjustable spider collar will give off creepy vibes as your cat slinks around under the full moon. Let your cat transform into one of its nine lives in this plush pink dinosaur costume. The best thing about cats acting out their fantasy of being a vampire? They come with built in fangs.Just add this elegant cape and allow your kitty to transform into an elegant, if not aloof, Dracula. These black bat wings will look stunning on your cat; particularly striking when on a black cat. Your kitty will be ready for any occasion with this awesome long-haired pink wig. Perfect on it’s own, or pair it with another outfit for a truly spectacular fashion statement. Transform your feline from house cat to king of the jungle with this awesome lion’s mane. Help your cat radiate his wisdom from another galaxy in these green Yoda ears. Transform your kitty into a unicorn with this non-toxic and easy to wear headband. Lightweight shark costume for kitty is waterproof and doubles as a raincoat. Also suitable for small dogs. Perfect for grumpy cats, this pirate outfit will really compliment his or her demeanor. Arrg! The side eyes and shade thrown by these cats and their expressions is hilarious! When I still had Quasar (may she rest in peace), we dressed her up as a witch one year. She was extremely tolerant and wore it long enough for some cute photos. What do you think of the 13 Best Halloween Costumes For Cats on Amazon? Will you be dressing up your pet this year?